being little • bristol uk fashion & lifestyle blog. : gingham. WEARING: vest - h&m ; belt - primark ; skirt - charity shop. Busy weekend before a busy week! Luckily it's starting off slow though. It's raining and pretty miserable outside here, but it sounds like the rest of the country is having a glorious summery day! Hope you're enjoying it if you have sun. 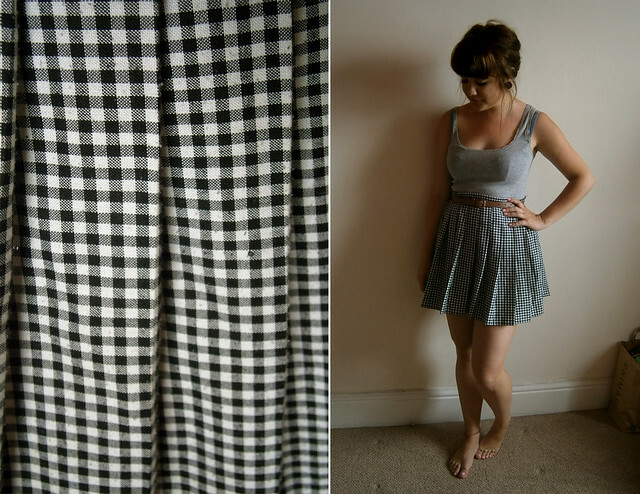 Today I've been doing a bit of coding for my website and taking photos of some clothes I have to sell. I have some really nice stuff - cute, retro and vintage things. I'm not sure how to go about selling them - on ebay, or just on here with paypal or something? What do you guys think? Have you sold clothes via your blog before? I think this outfit is missing a headscarf - it's a bit dull. But I probably won't put one on as I'm just hanging around the flat until later when I'm going to do some life drawing with my mum. I'm really looking forward to it as I haven't done proper life drawing since uni about 2 years ago! A headscarf/turban would be perfect with this outfit! I still can't bring myself to wear one. I don't know why, but accessories scare me! I really like this outfit. A headscarf would look equally as lovely. Turbans seem to be everywhere right now but I just cannot pull them off! I'm about to sell my old gear too! I was thinking Ebay. Either way I need to pennies before I start uni!! I can't cope with the sun at all. Not at all. The humidity is insane. I'm looking forward to it being a teeny bit cooler. Love the dress it really suits you. I love it, espesh with the simple grey tank, and can I have your tan please? you look fantastic and i just adore that skirt!!! hope your week isn't too busy and you are able to relax a bit! Your skirt is adorable, you always have the cutest outfits!